I am trying to get into posting a little....but, sadly, I cannot create....I only cry...I am hoping for this to change soon because I feel I really need an outlet of some sort. The friends that I have where I live have no interest in craftiness, so I only have my cyber friends for that. It is hard when I feel that if I could only go over to someone's house and make cards or do something crafty together, then it could help me to at least get this part of my heart back....sigh. Hopefully in time I will still be able to do so. Until then, I will try to post some older cards and things of mine to try to get into a routine. Thank you for visiting...it warms my heart :) Mmmmwaaahhh to all!!!! Pryn, First off I love your card especially your flowers. Second, but most important, I encourage you to try to keep creating everyday in your Mom's memory. As I told you before, keep her alive by talking about her and laughing over the memories you had together. It will eventually help. My Dad was an artist, so with every card or scrapbook page I make I find something that I know he would aprove of or make himself. It's like he is standing over me guiding me through my crations. You will find creating in Mom's memory wonderful healing tool. Stay strong and know you have many of us praying for you. Pryn, this is a gorgeous card. I am glad to see you posting again. I hope to see new creations soon as well. It can definitely be therapeutic. So many hugs for you. This is my friend Gina's post. Lessons from a grief monstor. Hope you will read it. And hopefully it will help a little. 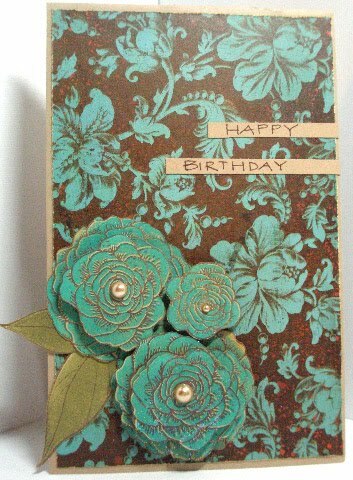 I love this card Pryn, those layered flowers are stunning! You are taking baby steps by starting to post again, little by little, you just can't force it! I wish I lived closer, I would definitely drive over and bring you to my house so that you could get inky with me!! Hugs!!!! Hiya Pryn! So happy you posted. 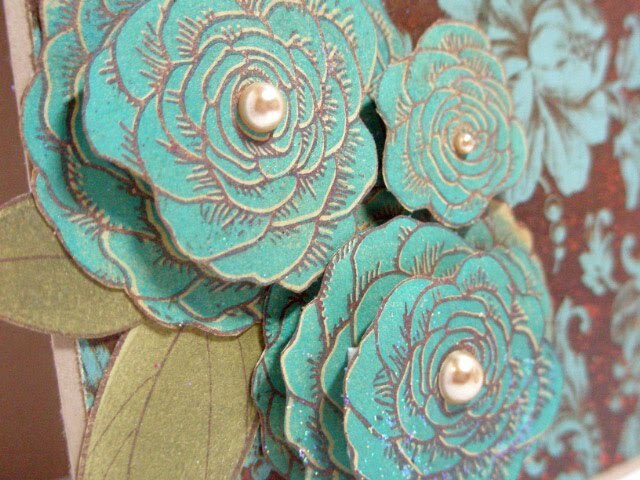 Love this card, adore the flowers! After my mother passed, it was very difficult to get into a routine again. I ended up quitting my business that I had established over 8 years all by my little self. It was the only thing in my life at that time that I even had pride in, and I was to depressed to even face anyone. I still do not have any urge to be around my friends. I crawled into my cave, I eventually started trying to climb out by playing online computer games and after a few years of that and another 30 lbs it was not helping. I was gaining weight even more for me to worry about and be down on myself over. I must say I new I needed to gain some kind of self worth again I wasn't feeling any even with 2 kids and a husband to take care of I didn't even want to take care of them, my husband cooked a lot of meals during those years. It hit one day 6 years after my mother passed that I needed some self worth again and I needed to do something for others at no cost, since I wasn't making any money. I started by joining an online quilting group, that totally reminded me of my mother because I had to finish the quilt she was currently making for my daughter before her diagnosis. That helped occupy my mind for a little while, to make a long story a little shorter because I can talk your ear off. I found a site to help soldiers in 2008 and from there it has helped me a great deal. Not that I do not have days I just think of her and cry. I still have those days. But I find myself doing things or saying stuff that reminds me of her and makes me smile, it use to tear me up inside. So what I am trying to say is hang in there g/f the pain will always be there, but keep in mind you have to be happy and your mother would want for you to be smiling and cheerful again doing what you love whether it is crafting or just getting out of bed for work in the morning. I think it makes it easier for me to talk about with online friends rather than people I see everyday. Sending prayers of strength to you, it takes time, might take years to feel some what like your self again. BIG HUGS to you! I wish you and I could have spent more time together when we met at the casino. You will be able to get through this. You will be able to create. Your mom shared this passion with you, remember the words she would say to you... Your mom wouldn't want you to shut down. I'm not that far away from you. Not too far North of the city. It takes me 40 minutes to get to the casino. I'm off on Fridays. Maybe we could meet for lunch. Danny might have to join us, unless it would be a weekend. Give it some thought and send me a message on fb. Hello sweetie, I can't add anything better than what's already been said...so I'll tell ya about your card instead!! I love it and rather new or old it is pretty awesome!! Love the colors and the flowers made me smile!! Hugz to ya g/f! Lovely to see you posting again Pryn. Your card is gorgeous...love those layered flowers. If I didn't live half way 'round the world, I'd LOVE to come craft with you. It's a bit sad that none of your local friends are into crafting...is there a local craft group you could join?? Crafting is wonderful therapy but it's also great therapy to be with other like minded people when you're down and need a lift. mwah back at ya' sweetie!! I'm with Mo.. I wish we lived closer together. She could get ya' inky and I would get copic on your @ss!